A movement exploration based on FloWork, C.I & Group Improvisation. In our modern (and sometimes competitive) society, the wish to fulfill our individuality might at times limit our feeling of belonging. In this workshop I would like us to explore the relation between the individual and the collective dance, and how we can link the practice of improvisation with our daily life awareness. Through the practice of FloWork and Contact Improvisation we will look for the combination of free movement and strong structure. While dancing, we will find efficient ways to use the skeleton in order to carry weight and letting go of unnecessary muscular effort. This may help us to support the flow and keeping the connection with our partner while staying grounded and available. Based on these physical qualities and ideas, together with various group improvisation scores, we will see how each of us can have the space and freedom to express her/himself through the body, while at the same time being open and available for the beauty of dancing and creating together. 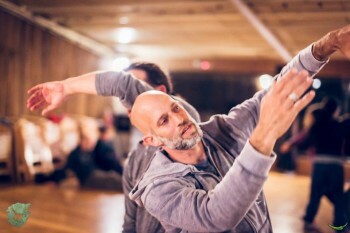 * FloWork is a solo movement practice based on principles from Aikido, Ilan Lev Body Work, and Contact Improvisation. At the age of 30 I finally began to dance, with a main focus on Improvisation and Contact improvisation, as well as Aikido and Ilan Lev Body Work Method. After few years of working as an architect while continued dancing, I chose to fully follow the path of movement, and dive deeper into the exploration of Somatic movement, Improvisation and social awareness. Today, alongside giving treatments and performing I’m teaching regularly for professional and non-professional dancers, in companies, schools and workshops in Israel and abroad. Since 2009 I’m the manager of the “Israeli C.I Association” and the Israeli C.I Festival, and also co-manager of Studio TENA, and “The Awareness Body Research” Program. The workshop is 160 € if you subscribe before July 18th (only friday dinner isn’t included) – 180 € for subscriptions after.